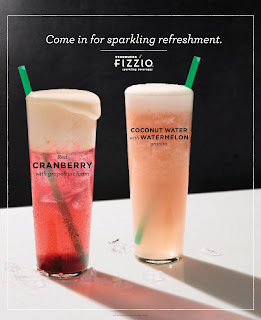 Cool off with a fresh take on granita and summer refreshment with our Coconut Water with Watermelon Granita Starbucks Fizzio Sparkling Beverage. For mid-day refreshment, sit back with the Red Cranberry with Grapefruit Foam Starbucks Fizzio Sparkling Beverage, a twist on orange bitters with an elegant pink grapefruit foam. This chic beverage shows handcrafted artistry in a new form at Starbucks. Celebrate summer refreshment like never before. “Starbucks Fizzio™ Sparkling Beverages give our customers more refreshing beverage choices made with the premium ingredients they expect from Starbucks. Unlike any usual carbonated beverage, these sparkling creations have layered flavors and textures where every Starbucks Fizzio™ Sparkling Beverage is individually handcrafted for each customer,” said Keith Cole, Starbucks Philippines head of marketing. To kick-off a refreshing line-up of beverages, Starbucks brings you the Fizzio Sparkling Hour. From 10am to 2pm on June 13 to 21, every purchase of any featured Fizzio™ Sparkling beverage – Cranberry with Grapefruit Foam Fizzio™ or Coconut Water with Watermelon Granita Fizzio™ - customers will receive P50 off on any lunch sandwich which includes Four Cheese and Garlic, Chicken Pesto and Shiitake Mushroom Melt on Flat Bread, Meatloaf on Cheese Focaccia Bread, Tuna Salad on Pumpernickel Bread, Chicken BBQ on Corn Bread and Tomato, Mozzarella and Basil on Flat Bread.